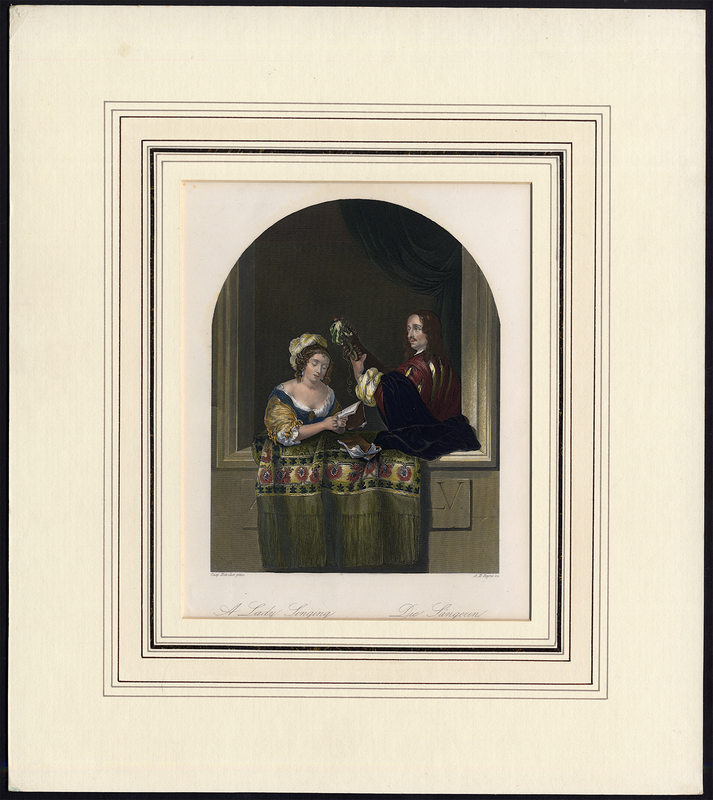 Subject: Antique print, titled: 'A Lady Singing'. It shows: a female singer leaning on a windowsill while singing from a songbook in her hands (a second songbook on the windowsill) while being accompanied by a musician playing a lute. Condition: Excellent, given age. Profesionally matted. Not examined out of matting. Medium: Handcoloured steel engraving on a vellin type paper. Size (in cm): The overall size is ca. 32 x 36 cm. The image size is ca. 16 x 20 cm. Size (in inch): The overall size is ca. 12.6 x 14.2 inch. The image size is ca. 6.3 x 7.9 inch. Description: This print originates from 'Payne's Universum, or, Pictorial World', published ca. 1850. Artists and Engravers: Engraved by A.H. Payne after Casp. Netscher. Albert Henry Payne (London 1812 - Leipzig 1902) was a steel engraver, painter and illustrator. Although he was English, he lived in Leipzig from 1839.